My mother was a seamstress. An AMAZING seamstress. She was a book keeper by day, at night she became the fairy Godmother. She sewed for me, she sewed for my friends, she sewed for anyone that asked. She sewed the daintiest lavender sachets and she sewed THE most exquisite wedding dresses and ball gowns. The first time I went into a store to buy a bra on my own, I sobbed my heart out. Because the best fitted bra's that I had were ones that mum had made-and she was no longer there to make them for me. Which brings me to my next statement. When your mother tells you that she is teaching you something valuable, believe her.And pay attention. I must have "absorbed" the basics, because I do okay. But when my mother tried to teach me to sew I would say "I dont need to learn because I have you to sew for me". My mother was a tormented soul and when I was 19, she committed suicide.The impact of her lessons didn't strike me until I had a child of my own...and I became a "whenwe". A "whenwe" is someone who's adult life becomes so removed from their childhood that they find themselves beginning sentences to their own children with the phrase "when we were your age..."
I asked my husband for my first sewing machine a year after we moved in together. I told him about my regrets and that I wanted to learn. Shortly after that, I discovered cake decorating. I threw myself into sugar and the sewing machine was left under its little plastic cover-coming out only for mending seams and raising hems. I love cake decorating, but with the addition of two more children it has become more difficult to do. Once I start a cake, I need to see it to the end without stopping.I cant do that with three young children (an almost 8 year old and 2 under 5's) and so I work through the night every time we have a birthday. I have inherited a few of my mothers issues and needed to find a distraction of my own. 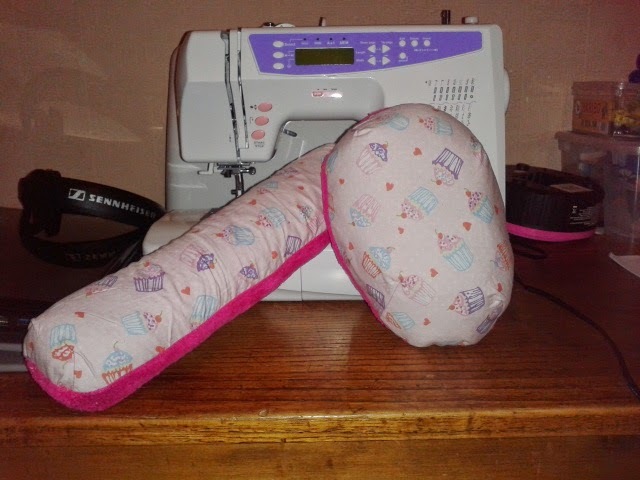 But something that would relieve my stress, not add to it.For many reasons I decided to get out the sewing machine. The first project I did at this point really bit me. I loved it, and if the kids needed me I could put the needle down and come back later without ruining my project. I really enjoyed that project and Lordbob praised me endlessly. When he asked later what would make it easier, I told him that I would really like a new machine to start again. As always, he didnt need justification and told me to do the research. I did (More in my next post) and he bought me the machine I asked for.A friend of mine had spent some time with me when I was sewing on the old machine and it bit her too. When I mentioned that to Lordbob, he suggested I give the "old" machine to her. I did and the two of us have become so engrossed in all things sewing that is feels as if not an electronic message between us excludes the subject-and so we learn together. My mum had me spend hours unpicking fabric-because it was the only thing I would do. She used to say "One day you will want to learn, and if you know how to unpick the proper way-you will realise that you can sew anything". She also said "press your seams,iron your fabric and then iron it again" So when I found this post featuring a Tailor's ham and seam roll (incidentally, my mothers maiden name was Taylor) I got excited. I completed my set this evening-it took me AGES to fill them. I used a block of small pet bedding from my local supermarket, It cost me £1.10 for a bag and after filling both, there is a fair amount left over. It's not my first project since my new machine, but it feels like the most significant. And so MammaNene, thank you for your pattern (and tutorial). It gave me a moment with my mum. I'm awful at this. Keeping up these daily posts-heck I cant even get one a month up. I still haven't decided about the direction I want this to go, probably because I have no direction myself. Sure there are a lot of things I like to do, and just as many that I'm good at. But there is a whole lot that I'm useless at. Not because I don't know how to do it, just there are things I prefer to do instead. So if I were to make a list, I'm sure Id have to make a list of the lists Id need to make. Perhaps that's a task I should set myself for a quiet Friday evening? When I don't need to be up with the sparrows to iron school clothes. But I don't want to dwell on the things I don't do or haven't done. Because if I do, I'm just going to carry on that way. So I wanted to put up some photo's of things I have done. Lordbob bought me a publishing package called Pageplus. Ive been using it for 3 or 4 years now and I've added other programmes from the same company-drawplus and photoplus. I'm just getting to grips with the latter two, but I've been really excited about the things Im doing on Pageplus. For valentine's day, the boys wanted to take something to school. The master is only 3 now and in nursery,and I was keen not to exclude any of his classmates. And as what goes for one goes for the other, I felt I needed to do the same for The Doctor. And then there was the bank-I really didn't want to break it. So I got a big tub of lollipops. Of course Pinterest teems with free printables and cute ways to dress them up, I just needed to pick one. Given that I refill my printer ink myself and I have a regular supply of 200gsm card stock, printing something seemed a given. So I set about trying to find one of those little lollipop tents-but I couldn't find one that really stood out for me.At the same time, I wanted to do something different for the ladies in the office at school. They do so much, and around the holidays when teachers desks are flooded with gifts-the emptiness in the office shouts louder. 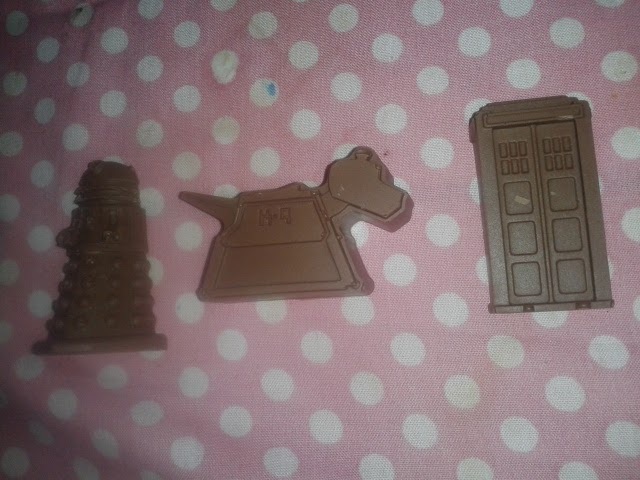 I decided to do chocolates for them in little gift bags. Again, the printer seemed the way to go-but I couldn't find a printable I liked. 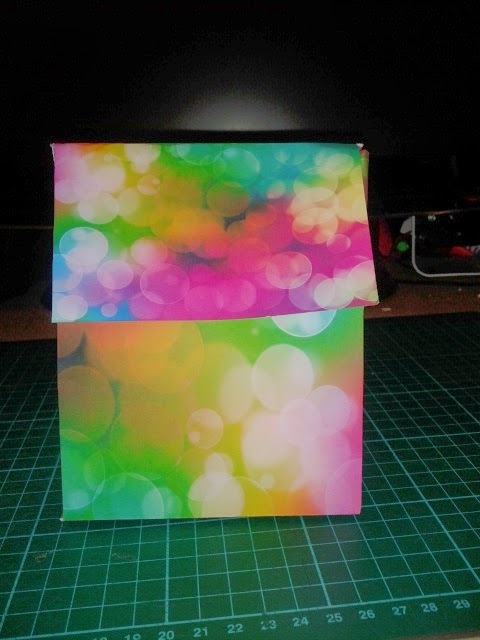 I found a template for some little triangular bottom boxes. So I found a royalty free image I liked online, and set to work. They were a simple strip of card, divided into three sections. I resized my image and added a text message (as the original didn't have one). 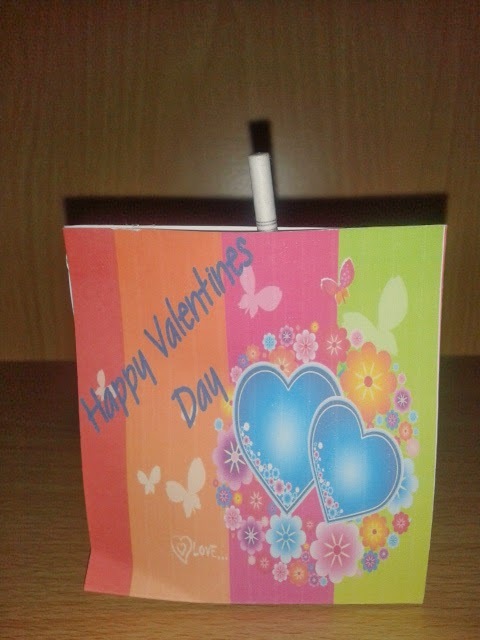 I added the image to the the two ends of the strip, folded it in three so that the image was back to back with the lollipop inside it and gave it two small dabs with my glue gun, on either side of the stick. And then the triangle bottom bags. For these, I inserted the template image into my page plus and used the straight line tool to trace it. 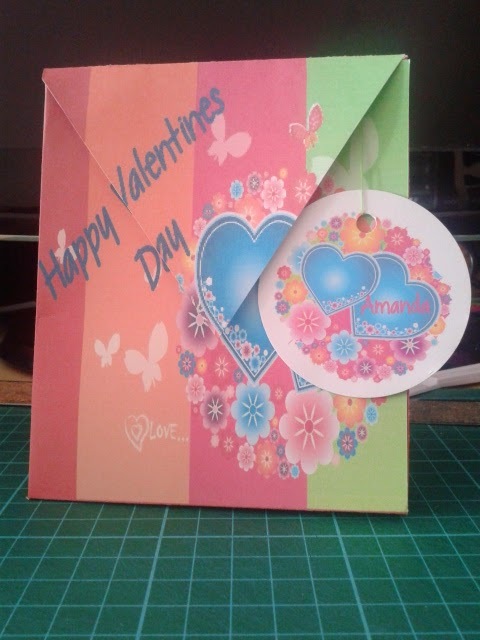 Then I increased the size and added an extra side tab so that I could join 2 A4 sheets to make a bigger bag. Then I inserted my image, and used the colour picker to select the pink to fill in the parts of the box where the image wouldn't fit. 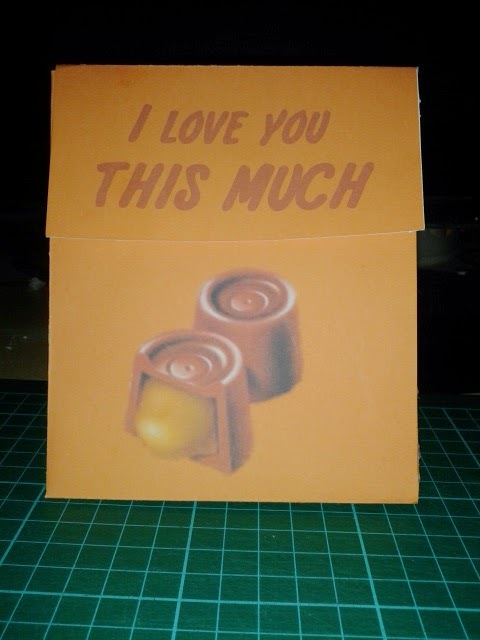 I got a bit frustrated with this one thought because I just had to have the text line up, whether the box was open or closed.I just wasn't happy with the end result until I had done that right. Because the bottom was wider than the top, it meant that the text had to appear somewhat "out" on my monitor than it needed to be. 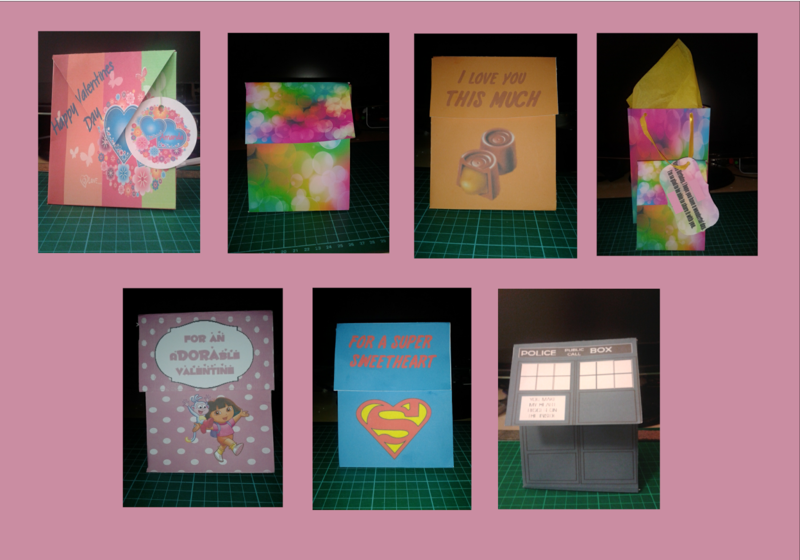 Once I'd gone through the process of setting the templates up, I decided to do a package for Lordbob and the children. Doing one for The Doctor gave me the chance to attempt my own drawing in drawplus,all straight lines. 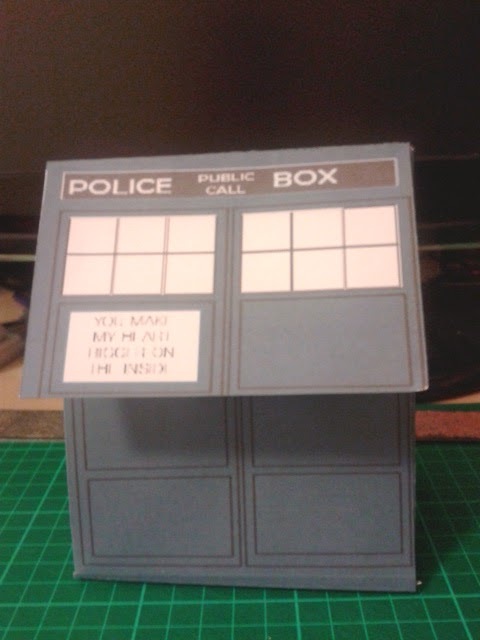 I felt that the triangular lid was just making things harder than they needed to be, so I replaced it with a rectangle for the Tardis. The text said "You make my heart bigger on the inside". The Master was going through a superman phase (he's moved on to Dinosaur train).... His was pretty straightforward. I can't find the site where I saw the heart, but it seemed pretty easy to recreate. I found an image of the shield and put it into the cut-out studio so that I could take everything out except the "S". 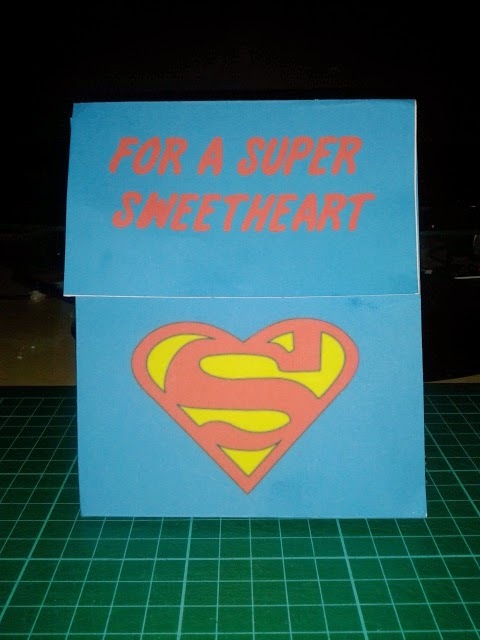 Then I used quickshape to put a heart around it, and one slightly bigger. And then I filled the colours and added the text. 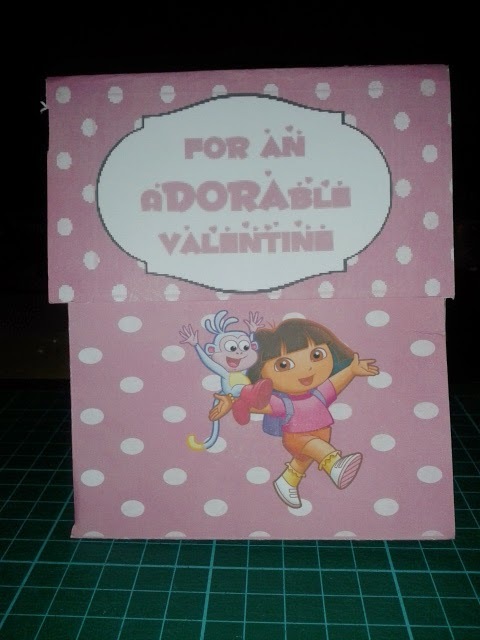 For this one I used some Polkadot Scrap paper, and added an image of Dora from the internet. I had the frame in among my embellishments and this was a perfect excuse to use it. So that was February play. March has been a busy month with lots of birthdays (including Lordbob's) and anniversary's (including our own) . The Doctor had an invitation to The Companion's birthday party (you might remember her from his birthday in June?) 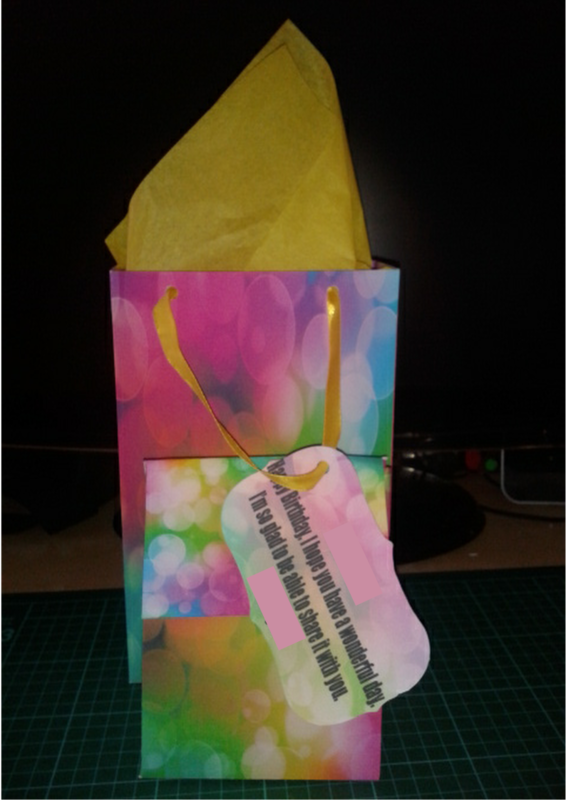 He wanted to use his pocket money to buy her gift so that he could say it "really was from him". They've been reading a lot, so he chose two books by an author they're enjoying at the moment. I wanted to add something handmade, so I measured up the books and made a bag that fit them exactly. 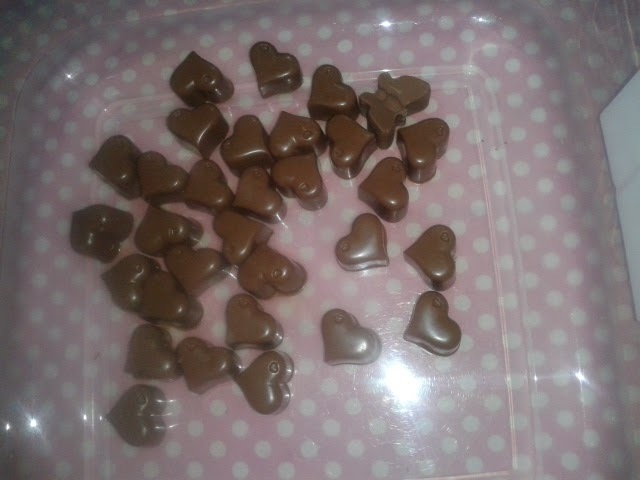 And then I made up a matching triangular bottomed bag and filled it with an assortment of chocolate.